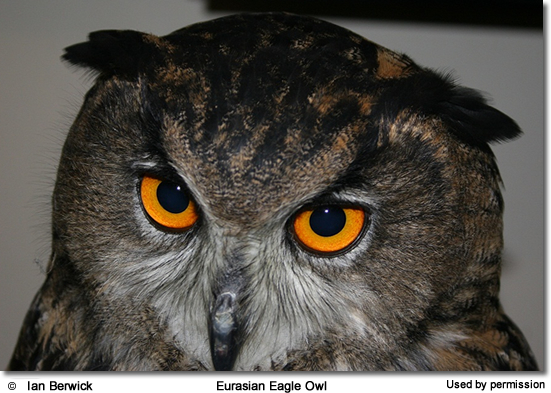 The Eurasian Eagle Owls (Bubo bubo) are horned owls found in much of Europe and Asia, where they occur in the mountains and forests with cliffs and rocky areas. They are usually most active at dawn and dusk. They are known by a variety of names, including Common Great Owls, Northern Eagle Owls, Desert Eagle Owls, Great Eagle Owls or Northern Eagle Owls. Eagle Owls are considered to be the world's largest owl species; they weigh about twice as much as the heaviest North American owl - the Snowy Owl, and weigh nine times as much as the common Barn Owl. They are well known for their power and aggressiveness. They are able to attack and defeat even the large Peregrine Falcons; and they can overpower most birds of prey, except the Golden Eagles. They have been compared to Golden Eagles in their aggressiveness and hunting style. 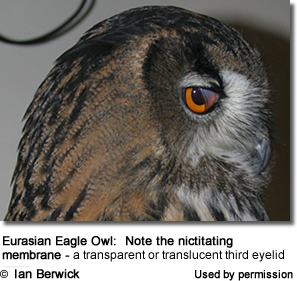 Like other owls, they have excellent hearing and night vision. Despite their large range, these owls are not common and can be considered rare and even locally endangered. They are trapped extensively, are at risk of shooting, and are also impacted by loss of habitat due to deforestation. In the wild, they live for around 20 years; captive birds can live up to 60 years. Because of their size and nocturnal habits, adults have very few natural predators and early death is usually caused by electrocution, traffic accidents and shooting. 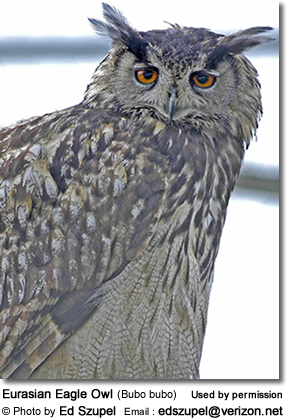 The non-migratory Eagle Owls are found across Northern Europe, Northern Africa, through the Middle East, Russia and Asia as far as China, Korea and Japan. They are generally absent from Britain and Ireland, but small numbers are now starting to breed in Britain. These adaptable owls inhabit areas with many rocks, cliffs, ravines and open spaces with scattered trees, coniferous forests, deserts and semi-deserts; as well as taiga, wooded steppe and farmland with suitable rocky areas. In recent history, they have also moved into urban habitats, breeding in quarries and buildings. They can be found at elevations of up to about 6,500 feet (2,000 meters) in Europe and 14,700 feet (~4,500 meters) in Central Asia and the Himalayas. 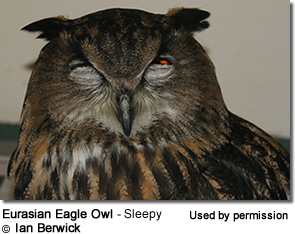 The Eurasian Eagle owl (Bubo bubo) is arguably the heaviest owl in the world; followed by the equal-sized or slightly smaller Blakiston's Fish Owl. 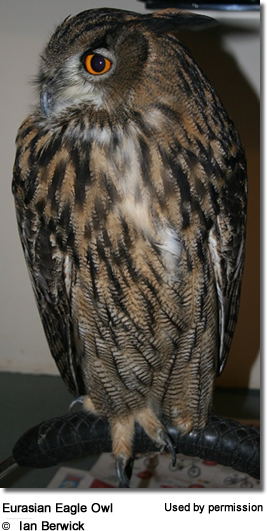 The Eagle Owl is smaller than the Golden Eagle, but nearly twice the size of the Snowy Owl. Its wingspan reaches up to 7 feet ( 2.1 meters). 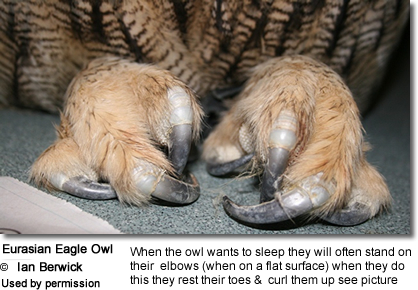 Its weight can go up to 10 lbs (4.5 kg); compared to the common Barn Owl, which weighs about 1.1 lbs (0.5 kg). Females are generally larger than the males, weighing between 3.9 - 10 lbs (1.75 - 4.5 kg); while the male weighs between 3.3 - 7 lbs (1.5 - 3.2 kg). The female stands about 2.5 feet (0.8 meters) tall, and the male about 2 feet (0.6 meters). The female's wingspan is between 6 - 7 feet (1.8 - 2.1 meters) and the male's is between 5 - 6 feet (1.5 - 1.8 meters). 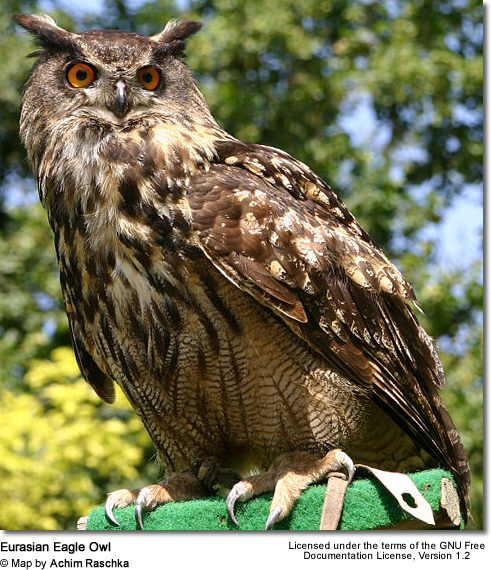 These owls have barrel-shaped bodies, large eyes and prominent ear tufts that are usually not raised upright. The upper plumage is brown to black and yellowish brown; the throat is white. On the back there are dark patches. There is a striping pattern on the back and sides of the neck; and dense freckling on the head and forehead. The outer portion of the flat, greyish facial disc is framed with black-brown spotting. The dark tail has blackish brown barring. There are also slight variations in the plumage and sizes in the different subspecies. The bill and the claws are black. 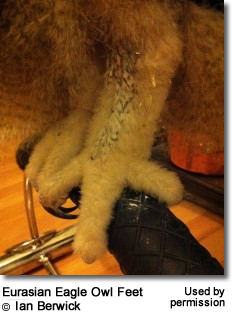 The legs and toes are fully feathered buffy-white. The color of their eyes ranges between a brilliant orange-yellow to a deep orange (depending on the subspecies). Gender ID: Males and females look alike; except the female is considerably larger and the ear tufts of males tend to be more upright than those of females. Hers are usually drooping down. 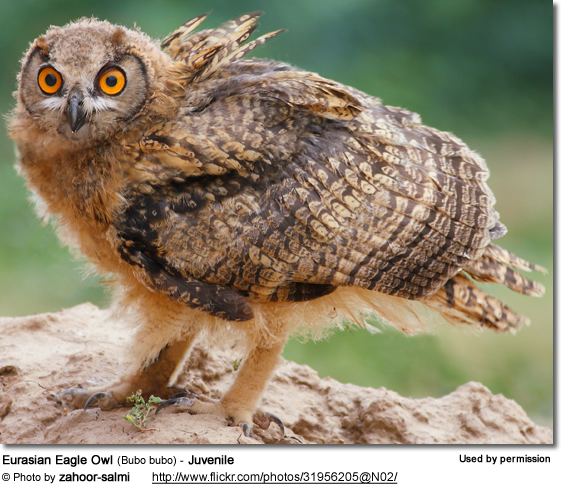 Juveniles have rudimentary ear-tufts, a narrowly barred under plumage and a buffy down on the head. 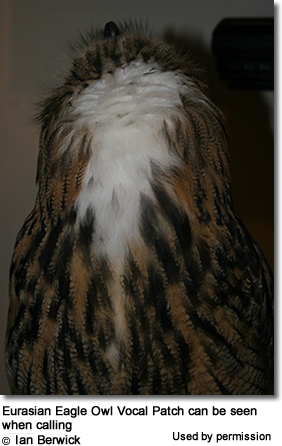 Eagle Owls resemble the Great Horned Owl, but are much larger in size. 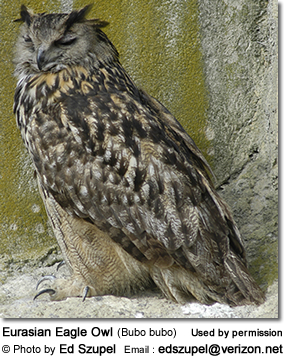 Eurasian Eagle Owls typically breed from the end of February to the end of April. They are considered to be monogamous, but some cases of bigamy have been recorded. They usually nest on cliff ledges, in cracks between rocks and in caves, and - to a lesser extent - may also take over the old nest of another species (such as storks or birds of prey). These resourceful birds have also been known to occasionally nest in tree cavities or on the ground. They may re-use the same nest site over several years. The average clutch consists of 1 -5 , possibly 6 white eggs; the number of eggs largely depends on the amount of food that is available at the time. The eggs measure 2.2 - 2.9" x 1.7 - 2.1" (56 - 73mm x 44.2 - 53mm) and weigh from 2.6 to 2.8 oz (75 - 80 g). The eggs are normally laid at 3-day intervals. The female alone incubates these eggs alone for 31 - 36 days, while the male feeds the brooding female. After hatching, the female continues to brood the chicks for two weeks, while the male hunts and brings food to the nest for the female to feed to the young. The nestlings leave the nest when they are about 5 weeks old and take their first flight 2 - 3 weeks later. They remain dependent on the parents for another 3 - 4 months. At about seven to eight weeks, the chicks are ready to fly, but still require food from the parents for several weeks after that. In Europe, the young become independent between September and November, at which time they leave the parents' territory. The young reach maturity when they are about 1 year old, but usually don't breed until they are 2 -3 years old. 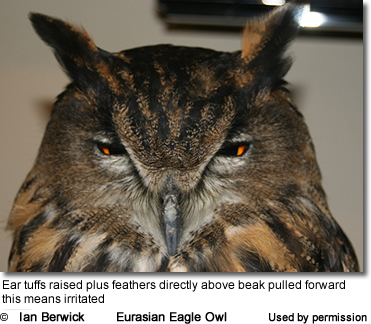 Eurasian Eagle Owls mostly feed on small to medium-sized mammals weighing 0.4 - 4.4 lbs (200 - 2,000 grams) - favoring rabbits and hares; but they will also take prey up to the size of foxes and even young deer up to 37 lbs (17 kg) . They also hunt other birds (including smaller owls), up to the size of herons and other birds of prey, such as buzzards. They may also eat amphibians, reptiles (including snakes), fish and insects. They hunt during dusk and dawn, catching their prey from an open perch on the ground or in flight; they also search rock crevices for roosting or nesting birds. They may even plunge into water to catch fish. The male's call is a deep resonant “oooh-hu” with emphasis on the first syllable. The female's call is more high-pitched uh-Hu. Other vocalizations include quiet, guttural chuckling and the female's bark-like scream. During the breeding season, the females sometimes make a coarse “kraaah” sound. The young also make this sound. The different members of a group can be identified by their different vocalizations. 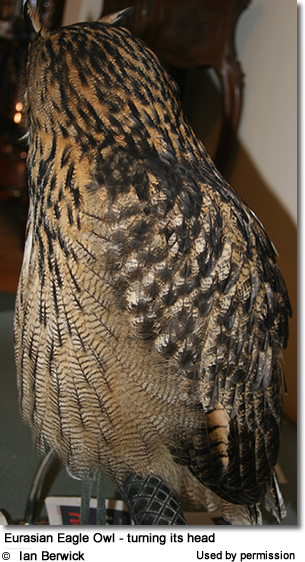 The Eurasian Eagle Owls may live up to 21 years or more in the wild. The longest reported age in captivity is 60 years.